In this post, we share with you essential tips to help you travel from Colombo to Galle, cheaply and comfortably. 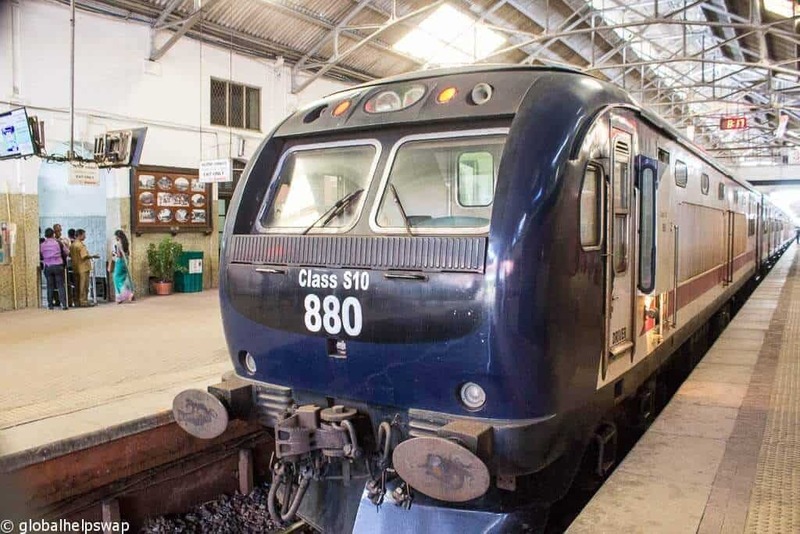 You might be questioning if you should take the Colombo to Galle train or if a taxi from Negombo airport to Galle might be easier. Read on to find out about our favourite and recommended option. We had 3 options to travel from Colombo to Galle – taxi, bus or train – and after some research here’s what we discovered. 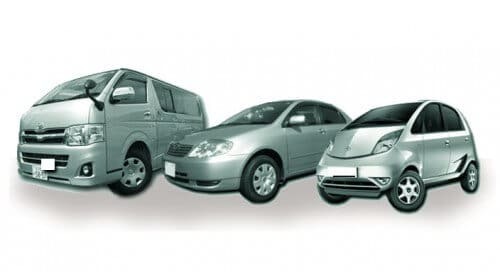 You can get a taxi to take you to Galle from most hotels and even directly from the airport. If you’re going from the airport you can go directly to the taxi desk before you exit the airport and arrange the transfer quite easily. Make sure you ask to go via the Expressway. At the time of writing, it cost between $75 and $100 to get the Galle. – It costs nearly a HUNDRED times more to travel this way. – It can still take up to 3 hours to do this journey if you get stuck in traffic. Not our recommended way of getting there. You can catch a high-speed bus from Maharagama Bus Station to Galle. Maharagama bus station is to the South East of Colombo City Centre. 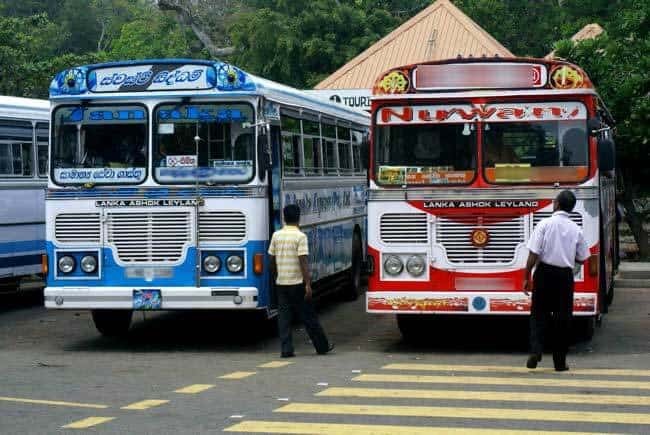 You can either take a taxi which costs around Rs 3600 / $27 from the airport, and Rs 1400 / $10 from Colombo Fort or you can take the 112 and the 138 bus to get there from the centre of town. The bus to Maharagama station (where you get a second bus to Galle) takes around 75 minutes and can be quite uncomfortable. Plus the drivers aren’t too happy with big luggage being taken on the bus. Southern Express Buses leaving Maharagama to Galle run from 5 am every 20 minutes daily with the last bus leaving Maharagama at 16.45pm. A ticket costs Rs375 / $2.8. They take around 90 minutes to reach Galle, taking the total trip to at least 3 hours. The cost or discomfort of actually getting to the station takes away the appeal of this option. Please note that you won’t have to do this (probably)! I guess the title gives away that this is our favourite way to get to Galle… with one caveat! You are likely to be closest to Colombo Fort station and will be tempted to get the train from there. Don’t. The Colombo to Galle train will already be full and you will have a very uncomfortable 3-hour journey standing on a packed train. You cannot buy tickets in advance and unfortunately, you cannot book a seat (unless you opt for Option 2 below). Start your journey from Maradana Station. A tuk-tuk here from the centre costs Rs200 / $1.50. It’s a couple of kilometres further than Colombo Fort station but it’s where the train from Colombo to Galle starts. You are much more likely to get a seat from here (although it’s still not guaranteed). When we got to the station a well dressed Sri Lankan guy approached us and offered to help us buy our tickets. As we didn’t know what to expect at the station we followed him. He bought us the tickets and used our money to buy himself one as well. We didn’t want to argue with him over a dollar but thought we’d caution you over it. A second class train ticket from Maradana to Galle costs Rs180 / $1.36 (no that’s not a misprint!) There’s no first class – except for one train, see Option 2. There’s no AC on the train but the fans on the ceiling worked and the open windows let a nice breeze in which made the temperature comfortable. We do have to warn you when it comes to boarding the train the normally polite, well mannered, gentle Sri Lankans turn highly competitive. Everyone tries to get on the train first to nab a seat. It becomes a bit of a battle. We got the 2.30pm train and despite the battle, which took us by surprise, we managed to get two seats. Hoorah! We also got the seats right at the back of the carriage which meant that we could stash our backpacks in the space behind us. The journey itself is one of the most scenic train journeys we’ve been on. And given that we’ve been on a lot of trains, that’s saying something. The journey is mostly along the coast, with open sea views for the majority of the way. There were a few sellers selling water, fruit and delicious snacks on the way which made the journey even more interesting. If unlike us, you don’t mind waking up a little early you also have the possibility of travelling in a first-class carriage AND pre-booking your seat. Rajadhani Express attach an air-conditioned carriage on the 6.30am train to Matara, which starts at Colombo Fort and stops in Galle. You can book your ticket through their site here. There is one train every day of the week, except for Thursdays. Tickets cost a very reasonable Rs1100 / $8.3. Try to book a couple of days in advance as there are only 48 seats available. (Please note as of September 2017 Rajadhani is temporarily closed to refurbish their trains). – No guarantee of a seat, unless you take the first-class train at 6.30am. Our preferred way to get from Colombo to Galle. We really enjoyed this train journey and we hope you get to do it one day. BUDGET: Green Wood Garden This homestay has an excellent reputation for service and cleanliness. The place has free wifi, bikes and a garden. MID-RANGE: Pedlar 62 Guest House If you want to be in the heart of the action, then this guesthouse is for you. The food and hospitality are second to none. There is free wifi and a/c in every room. LUXURY: Jetwing Lighthouse We have stayed in Jetwing properties in the past and loved them. They truly are eco-luxury hotels with everything you would expect from a top hotel with the added benefit that by staying here you are also helping the planet and the community. Highly Recommended. Thanks for the comment Paula! You will love it here. Have a great trip. Hello, your post is really helpful. I’m going to srilanka this May 30 with a budget. Could you help me with this? I. My flight to colombo at 10:40 AM, How long does it take me from the airport to Colombo Fort Station and what is the cheapest way to get there? 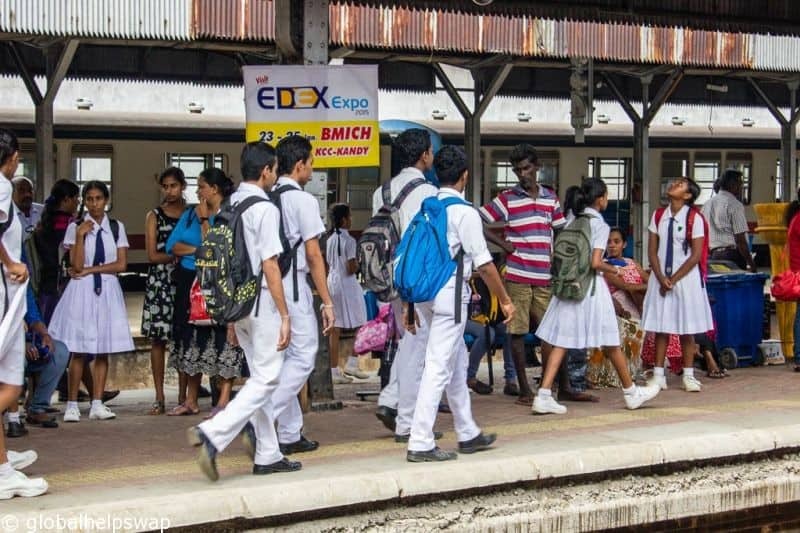 2,If I take a tuktukfrom the station to Maradana, is it possible to get a train after 230pm or how do I get the time schedule of the train from Maradana to Galle? 3. I want to go to Kandy from Galle, also need cheapest way, what is your recommendation? Thank you very much. Waiting for your reply. This is a rather terrible post I’m afraid. So when gettin the bus you are likely coming from the airport and must get a taxi if in Colombo. Yet when taking the train there is the assumption one is in Colombo but can use a tuk tuk if not at the fort station? Let’s think logically, it’s likely that whatever the situation and location prior to taking the train, it is the SAME as when gettin the bus. You like the train, fair enough (I generally prefer trains over buses jn Sri Lanka too) but don’t give false conditions just to back up your preference. Thanks for your feedback Sam but what has the airport got to do with it? Can you send us an e-mail please. Hi, it seems the train goes every 4 hours. If you got the 2.30, does that mean the next is at 6.30? I can’t find a schedule online other than the 4 hours comment. Thank you for visiting Colombo and thank you for this wonderful blog. I hope you left with more good memories than bad. Hi Angel! We did and loved our time in Sri Lanka. Thanks for the comment. Yes, that’s what we found. We took the 2.30 one. hello… I am a ski Lanka. I am so happy to see this post and thanks for saying that “Sri Mankind are polite ” . If somebody is about to visit SriLanka, I will be able to guide you the cheapest way to your destination. Contact me when necessary. Hi, how long did the train from Colombo to galle take? Its best to send me an e-mail so I can reply in more detail. Thank you for your comment Menaka. Thank you for this super post, really usefull. I have a quick question, when I booked my tickets on Rajadhani Express”s website, they told me to re-print my tickets, Can I print my tickets directly from home or I have to ask a station desk for re-print? hmmm, I am not sure to be honest as we collected ours at the station. Sorry we could not be of more help. I’m planning to come colombo next month from india. How should i go to 501 Galle Road from Airport ? Hi, do you know if we do book the first class train, which seats are better? in another word is if we are traveling south, we should pick the seats on the right side so we can see the view clearly? Thanks! 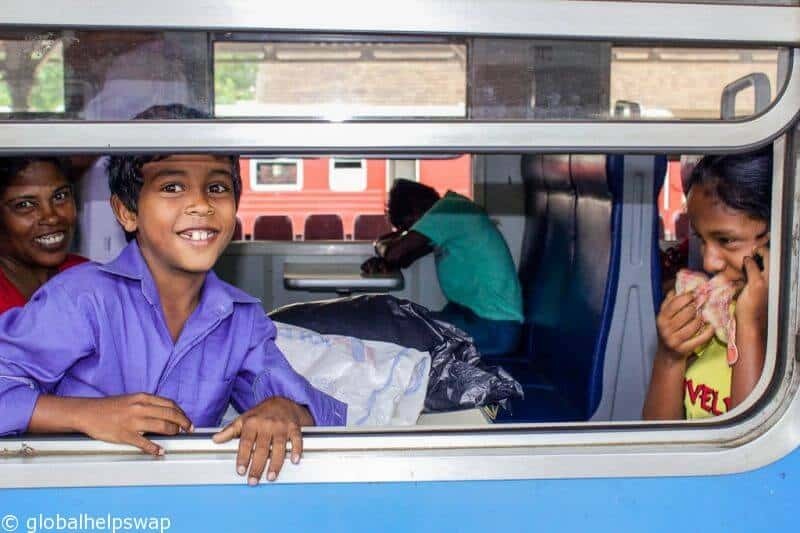 We would like to catch the train to galle and book acomadation , as this is our first time in Sri lanka we are looking for any help we can get. Thanks for your comment. We don’t actually organise trips, we just write about our own. We advise to book your hotel before you go and book the train from Colombo once you arrive. Have a great trip. Good question! I think if you are travelling south the seats are best on the right as the ocean will be on your right. Have a great trip. Sorry we can’t help you with that. I am sure google can help. Have a great trip. Hi Karen, I am planning my honeymoon to Srilanka in Dec from 15-21, and we are planning to go to Galle, can you suggest the hotel where you stayed and also the budget. Also, have some more questions can i please get your email address? I am planning to go from Galle to Colombo airport (departure of the plane is on Dec. 10 2015, at 21.45). Please, give me advice. Is it possible (and eventually how) catch easily this flight. Thanks!! I have rather large feet do you think they will fit under the seat in front of me. I will also be travelling with an ikea fridge for my friends wedding present. Do you think it will fit in the overhead luggage area. Thanks for all your help. I’m so scared and excited about this trip. p.s fridge is a 250 gti model. Just got back home from a trip to Sri Lanka. It’s an amazing country with nice and helpful people. I had the time of my life there. Great post. This is just the information a traveller really requires. Hotels and flights are easy to book. The transfers are always the difficult part. Many thanks. Great post…finally got some useful answers while googling about train travel in Sri Lanka! ?? Hi guys, I am Jean from Malta and together with my girlfriend we have booked a 30 day trip to Sri Lanka in Nov 16. We are still at the initial research stages…I want to spend one day in galle….I will be staying in colombo for the first 3-4 days and I want to fit galle in one of these days…plan is to catch the earliest train possible….arrive galle early morning….spend the day there and catch the last train back from galle to colombo on the same day….any suggestion please? Hi Brian, we just took the train from Galle back to Colombo yesterday and we saw a few people with the 200 gti so I’m not sure if your model would fit. As for your feet, my husband has shoe size 13 and his paddles fit under the seat just fine. Btw Karen and Paul, thank you for this informative article! I was there two years ago. I had the time of my life. Great country and very polite and nice people. We totally agree. Thanks for the comment. Hello all, on 17 March, I will arrive at S/L airport around 4am , how to get to Galle road please ! The tip about going to Maradana Station instead of Fort Colombo Station is worth its weight in gold! Thank you for that tip. Comfortably found a seat at Maradana and watched all the foreigners and locals alike fight to find a seat with most left standing all the way from Colombo to Galle. Thanks for the comment. We are glad the advice worked well! Happy travels! I think you just convinced me to take the train to Galle! However, do you know how to best get to either station from the airport? I am arrive at 5am and would like to have it all sorted. I will probably splurge and take the AC one so I won’t have to fight for a seat and could board at either station. Any ideas how much a taxi or tuktuk is? I require similar info, My flight lands at 5am. Hi Sian, Thanks for your message and comment. We agree, it will be a bit tight. The next train is at 08:17 which you should easily make. Have a great trip! We would take a taxi to be honest. After a long flight, you just want to get to your destination. You will probably miss the first train at 06:30 but should have plenty of time for the 08:17 one. Have a great trip! Thanks for the comment, I think you contacted me, is that correct? Any suggestions on how to book an apartment for minimum one month? You could try Airbnb or Flipkey. Hi, I’ld like to get in touch with you guys. Visiting SL soon and have a bunch of questions! No worries, please e-mail us to ask us any questions. I came across this post while doing some research for my trip to Sri Lanka in August. I am arriving at Bandaranaike at 05:15 in the morning. Is it ambitious to think I can make it out of the airport, into a taxi, and arrive in time for the 6:55 Rajadhani Express from Colombo Fort? You might just make it but we would recommend you getting a later train to be on the safe side. You never know, your flight could be delayed, etc. Have a great trip! Hey! Does this train stop at Hikkaduwa on the way?? Yes, it did for us but it’s best to check as the timetables does change. Hi Guys and thankyou so much for your help on the train journey to Galle. My hubby and I aren’t as fit as we used to be and your blog has been a huge help to us….think we’ll try for the 1st class cabin 🙂 Enjoy your travels ! Thanks for the comment and kind words! Are you still in Sri Lanka? Interesting comment. We don’t actually organise trips, we just write about our own. We advise to reserve your hotel before you go and book the train from Colombo once you arrive. Have a great trip. I really liked the idea of traveling from Colombo to Galle, I was wondering can I travel by road or by hiring any transport service ? Would it be also cheap or not ? You can but it will be a lot more expensive. Hello, first of all thank you so much for this useful posting! I was so curious – how do you know which side of train is for sea side view? I am about to reserve first class ticket (6:30am one) and i don’t know which side i should reserve 🙁 Can you please help me? I am visiting Sri Lanka on Feb 17th, 2017. Want to join in for the trip? The sea will be on the right side but other trains coming the over way will pass that side too. I too want to go from Colombo to galle by train . I don’t want to wake up early .. help ?? I am sure there are later trains Sarita. Yes, they are refurbishing their carriages at the moment. Quick question about the train from Colombo to Galle – can you hop on and off? are there any stops? They run quite frequently so you should be fine. Yes, there are over stops but you can’t hop on and off. The ticket is only valid for the train you are on. 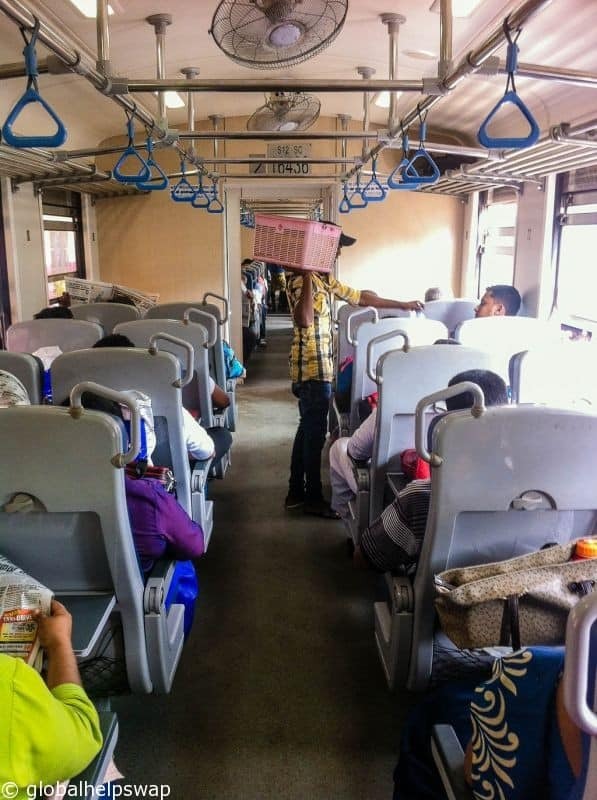 With the Maradana station train, if you don’t get a seat, can you stand on the train? Great post by the way, very comprehensive info here. Thank you so much! Yes, in 3rd class you can. Awesome work guys, Very thorough post with a lot of useful information. It’s a pity SLR don’t run intercity trains between CMB and matara. They should, I mean every other main lines have booking capability and It’s quite trouble some to get a seat even from maradana sometimes. Even if there is a highway running to matara the scenery is unbeatable As you’ve pointed out. My partner and I would love to do the Colombo to Galle train journey. However we will have been in Australia for a month previously and have large suitcases. Are we going to struggle to get on the train / bag a seat with proper luggage as apposed to rucksacks? Thanks! Great question! We managed to fit ours behind the seats. However, it means you have to get on quickly to nab the seats. Maybe one of you get on, and the other one brings the bags in one go? Good luck! How long does the train from Colombo to Galle Take? It takes around 3 hours. Just chanced upon this post and its so helpful. I do have some questions and not too sure if you would be willing to give me some tips.